Stained glass is a term commonly used to describe a range of techniques for decorating and making images with coloured glass, usually for windows. The technique of silver staining glass is often used in conjunction with painting in black or brown on clear and coloured glass. The techniques most familiar to us were discovered in the middle ages, but these skills were neglected from the later-sixteenth century. Until the nineteenth century, windows were usually painted with enamels and became a predominantly painted art. 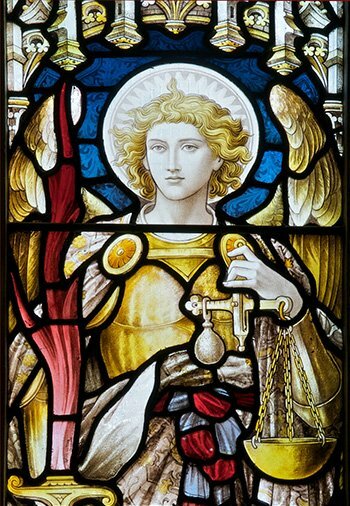 This changed in the mid-nineteenth century with the advent of the Gothic Revival, and the rediscovery of the artistry of the medieval craftsmen resulted in the production of thousands of stained glass windows for churches in a way that defines modern perception of the art. Over the last sixty years artists working with glass have taken the use of glass in new directions for a wide range of interior and exterior architectural contexts. This catalogue draws together hundreds of examples of the art in Wales from the fourteenth century up to the present day. These examples are searchable by date, artist, subject and location, listing about 2,700 windows with over 7,000 photographs from more than 500 sites across Wales. Although this database is not a complete inventory of such material, it is hoped that it will form the basis for further investigation and research, as well as future publications.